“Who are your competitors?” is a seemingly simple question that can be surprisingly difficult to answer. Do you answer with your most common competitors from a sales perspective? Or, the leaders in the industry even if you don’t compete directly? Or, the companies you’re not yet competitive with, but you hope to be after certain product development efforts? Do you repeat those answers for each of the verticals and geographies you serve as well?Tackling competitive intelligence (CI) in an ever-growing competitive landscape is challenging -- you could spend every waking hour researching every competitor if you took this wide approach. And there may be value in evaluating each of those players. But for your own sake and the sake of your stakeholders who will leverage your CI deliverables, it can be incredibly helpful to focus those efforts on groups of competitors. In other words, taking a tiered approach to competitive intelligence can help you focus on the highest priority companies and help deliver digestible and actionable resources. Here are a few ways to go about breaking down your competitor list into tiers. Not all competitors are direct competitors. In fact, you may frequently come across indirect competitors - those in your industry who sell a related solution. These companies may sell a similar solution to a different audience or industry or geography, or sell a tangential solution to your same audience. Distinguish between these companies and your actual direct competitors - those that offer a similar solution, solving the same problem, to the same audience. Finally, separate out your aspirational competitors - those companies that you admire for leading the way in product or marketing in related fields or with related solutions. 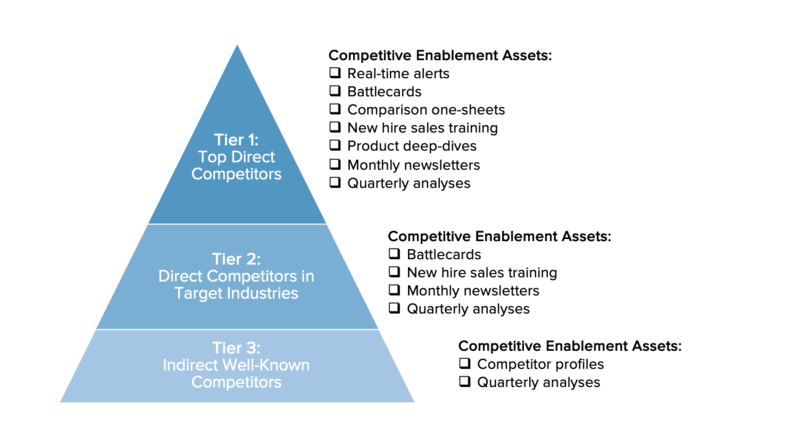 If you have a lot of direct competitors, sales competitiveness tiers can be a helpful way to organize those companies. This approach involves looking at how often each competitor comes up in sales opportunities and ranking them by frequency. The competitors that come up in (nearly) 100% of deals? Those are the tier 1 competitors. The companies that come up in a significant majority of deals? Those make up the tier 2. The less frequently a competitor comes up, the further down the tiered list we go. For a company that serves multiple verticals or industries, each with their own sets of specialized competitors, taking a vertical/industry approach to competitor segmentation is an obvious choice. There may be some overlap - some competitors showing up in multiple industry lists - but be sure to include each relevant competitor on each vertically-focused list. This will allow you to best serve the stakeholders focused on each industry, sharing resources that are uniquely relevant to them, and aligning the competitive guidance to how you compete with a particular company in each specific industry. Nearly every industry has established legacy players as well as emerging startups tackling the same problem. Breaking down your competitors by company stage - legacy vs. startup - can be a helpful way to identify trends in the competitive landscape and enable your teams to battle many competitors at scale. Similarly to company stage, you may find that competitors in your space tackle a particular problem in different ways. Hardware vs. software, on-premise vs. cloud, services vs. products, and so on. Segmenting your competitors by the type of solutions they offer can be another way to scale your competitive intelligence efforts to a large group of competitors. Imagine creating one battlecard for all of the on-premise solutions instead of a nearly identical battlecard for each company in that category. Each of these approaches may be more or less relevant depending on your industry, stage, and solution. Feel free to mix and match these approaches as needed, such as Sales Competitiveness + Vertical/Industry groups to get the top competitors for each business line, or Company Stage + Type of Solutions to understand which approaches are most common among legacy vs. emerging competitors. Group competitors into tiers, according to the above framework that is most relevant. Create a list of all the possible enablement resources you could create with CI. For each tier, discuss and agree upon which enablement resources are necessary. Competitive landscapes are far more complex than a list of your top three competitors - but also more manageable than a list of dozens of companies in an industry. Taking a tiered approach to your competitive landscape can help you get a handle on competitive resources, identify and communicate trends in the industry, and see success with enabling your team to win against any competitor.